“I like our situation very much,” wrote English novelist Jane Austen in a letter to her sister Cassandra describing the profound impact that Bath had upon her first visit. 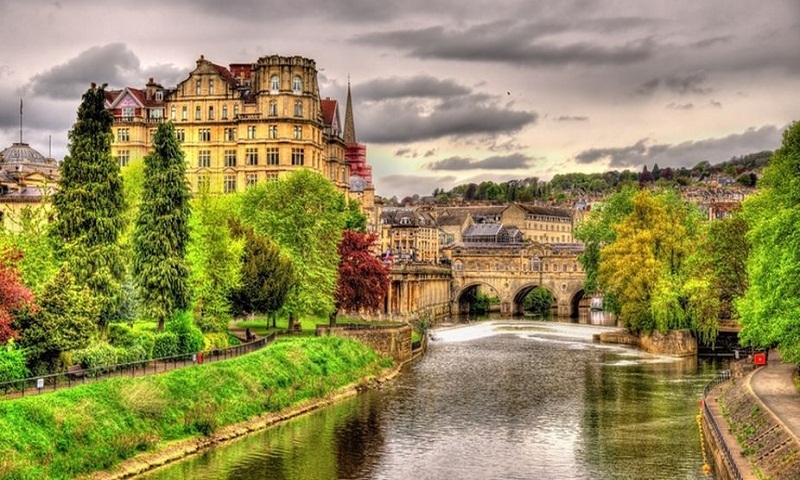 Better known as the city of spas, Bath, embellished with Roman and Georgian-styled buildings and the river Avon flowing across, has enough to satiate the appetite of a hungry traveller. A visit to the countryside, with lush green meadows, hills and streams, and the landscape perfect enough to unleash the poet in anyone, is always a pleasant experience. Enroute to Bath, one can enjoy the sublime beauty of the countryside that has since ages been the source of inspiration for many English poets. Being the largest city in Somerset, England, it has a lot to offer — from the Roman-built Baths to the Circus. Founded by the Romans as a thermal spa in the first century CE, today it is a well-developed and elegant town — and a major tourist attraction. It was declared a World Heritage Site in 1987. The city in itself is a visual delight with homogenously architectured buildings — and the day we visited it was also endowed with a clear sky and pleasant weather. One of the special attractions of the place is the Bath Abbey or the Abbey Churchyard. To the right of the Abbey, the Roman Baths and the Pump Rooms form a large complex. The original Pump Rooms were completed in 1705. However, due to the demand for taking the waters, they were extended and rebuilt in 1790. These rooms were built in the neo-classical style reflecting the cultural evolution of the spa city in the 18th century. Bath is well-serviced by taxis and public bicycles to take visitors to their destinations. It was earlier served by trams, but in 1936 these were replaced by buses. Another remarkable place to visit is the Jane Austen Centre, a small museum chronicling the life and times of the famous writer. The centre, at No. 40 Gay Street, is a house very similar to the one No. 25, where she stayed. The city had a great influence upon Jane which is visible in two of her famed novels, “Northanger Abbey” and “Persuasion”. The city takes pride in calling itself “Jane Austen’s Bath”. From the centre, one can take a walk to the Avon canal, which has flocks of sea gulls around this time of the year. The city has several good cafes as well as restaurants, where one can usually stop for a very English cup of tea with scones or have a nice dinner of fish and chips — with a glass of wine. Bath is still as vibrant, lively and exciting a place as it must have appeared to the young Austen at the beginning of the 19th century.